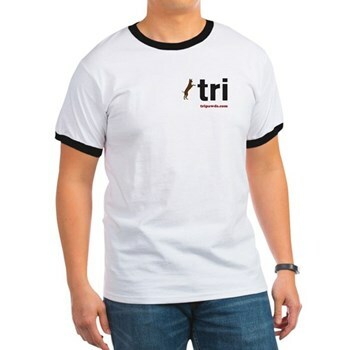 Vince Lombardi said, “It’s not whether you get knocked down, it’s whether you get back up.” He must have had a three legged dog, because that quote summarizes the Tripawd Spirit … if at first you don’t succeed, Tri Harder. 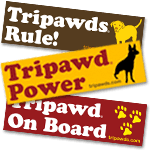 We’ll be adding lots of new designs to Jerry’s Café Press store soon, but just wanted to announce a few of his Tri Nation branded items … like this oval auto sticker for showing your Tripawd Pride on the road. Styled like those popular European nation auto decals, the tri oval sticker represents all things Tripawd – resiliance, perseverance, vigor and vitality. Available as single stickers or in convenient packs of ten, Tri stickers make great gifts. 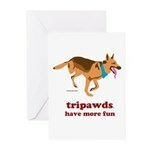 Why not send some to all your Tripawds Friends? Tri stickers are printed on 4mil vinyl using water and UV resistant inks – meaning no fading in the sun or bleeding in the rain. Other Tri Nation items include the 100%cotton ringer t-shirt, raglan hoodie, baseball jersey, the popular ceramic travel mug, and more! 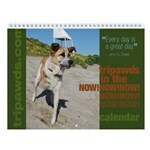 Proceeds from all purchases help support our continuing efforts to keep the Tripawds Blogs community and discussion forums online. Thank you for your continued support!